One month has gone since my last blog post. A lot has happened in real life, and in my game worlds as well. I am now unemployed – partly because I couldn’t keep my job when moving, partly by choice (to concentrate on finishing my dissertation thesis before looking for a new job). I have been on leave the past three weeks, even though I was still and will continue to work here and there to finish my tasks. But in general, I was focused on stuffing everything we own into moving boxes. My hands (yes, plural at this time, I’m afraid) took it surprisingly well. It seems that the RSI does not show in what I call “naturally using” the hand or “macro-movements”. No idea if that’s accurate. But wrapping dishes and glasses in paper and putting them in boxes, carrying moving boxes, cleaning shelves – all of this does not cause me RSI pain! But handling a PC mouse or writing something using a pen does. But we have moved now! I never lived outside of my home town (but as a teenager, I swore to myself that I would move away one day – not because I hate my home town, just because I always felt I wanted to live somewhere else). We’ve come to Hamburg for a week or more ever since bookahnerk and I got together (so… 13 years now). So, Hamburg kind of feels like my home-away-from-home. I still remember December 2004 when we were standing at a bus station waiting for the bus to take us back to his parents’ place when he asked: “Could you imagine living in Hamburg?” and despite my best friend living here, I said: “No way!” – simply because I was sure I’d never feel comfortable living in a big city. I’d not feel comfortable living in a small village either, but a city like Hamburg… I’ve loved Hamburg from the beginning, though. And with every visit, I loved this city more and more. So when we were standing at the beach of the Baltic sea not too far from Hamburg two years ago and we discussed our future, I said that yes, I could imagine moving to Northern Germany. I didn’t think it’d happen so fast, though. But it’s good. It’s Hamburg, after all. The only city I’ve ever loved! So this is the “real life” part: I am drowning in moving boxes. Hand-wise, my left hand has made some small progress while my right hand has gotten a lot of issues. Not RSI, I think, but it’s definitely tired of being used so much for PC work. Both wrists have been aching for a week now or so, due to moving around heavy boxes all the time. We have more things than storage space at this time. Typing is no problem on my keyboard, thankfully. I am using two PC mice (the symmetrical trackball one – Kensington Orbit – with my left or my right hand depending on which hand feels better and the Havit vertical mouse for my right hand) – and the Steam Controller for gaming. I don’t get much gaming time anyway, so all’s fine, I guess. 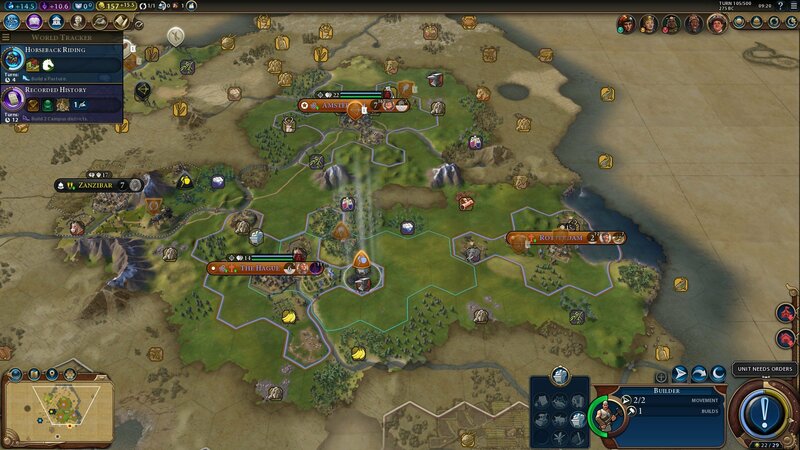 Speaking of gaming: The Civ VI expansion, Rise and Fall, has come out. I thought I’d really like the loyalty feature. But so far, this and the Dark/Golden Age have been more of a nuisance. I know part of this is just me adjusting to the new features. Previously, I played the way I liked but now I feel that I need to get certain things or do certain things in order to avoid getting a Dark Age. I also cannot found cities wherever I like as they produce negative loyalty when they’re too close to another region and could rebel and split from my own empire if the loyalty remains that way. Altogether, I think I will like it once I get to know everything better. I also bought the Blackwell series games. They are point & click adventures which are perfect for a little casual gaming that doesn’t require a lot from my hands. They can easily be played with the Steam Controller which so far is the best option for playing for me, especially when a game doesn’t require fast reactions. Some time ago, I bought Orwell and played through it rather fast. It was a great fun game. I just did not really understand why the developers were sending me weird emails – until I realized that another Orwell game was coming out! With everything else going on, I totally missed that. It is going to release three episodes over the span of 6 weeks. You only need to buy this game, Orwell: Ignorance is Strength, to receive all episodes. I fought against the urge to buy it immediately for a total length of… 1 or 2 hours, I think. I saw 8 positive, 0 negative reviews on Steam and then decided that I just had to have it. Especially as Steam offered me the game for 20 % off, since I own the first game. I haven’t played much yet as I want to go through it slowly as not to miss anything. I am deliberately not telling you much about the game as I am always careful with spoilers for such games. The short version is that you’re working for the government and need to provide them with information on possible terrorists. You get access to emails, telephone conversations, but also read newspaper articles and blogs and need to determine which information there is relevant and which people may be of interest. Piece by piece, you collect information about these people. I am also so excited for Rift Prime starting! Even though my left hand is aching, I want to at least create a character and try playing a bit. My choice will be an Eth chloromancer just like I played one when I first set foot into Rift (dwarf and eth are my favourite characters to play). If I hop from rift to rift, I could get away with levelling without having to use my hand too much! I am also annoyed by the golden/dark ages and the loyalty systems in Civ6. It feels like it’s there to encourage/force you to play “the right way” instead of how you want to play. And once in a Golden Age the bonuses are negligible and nothing much really gives you era score anymore, so it feels designed to make you seesaw in and out of dark or normal ages and in to golden again, rather than simply rewarding you for playing well. All in all, a swing and a miss in my book. I’ve been playing a bit more and I guess it’s a system I can live with, but it’s definitely not the feature I thought I would love to get.